In her life, Jessi Zazu, 27, has toured the world as a musician in the group Those Darlins, recorded three studio albums, starred in music videos and exhibited her original artwork in individual and group art shows. With parents who are artists and a father and grandfather who played music, Zazu was destined to inherit their love of the creative life. She started playing the guitar as a child and learned to do screen printing during her teen years. By the time she was 17, she and some friends formed the band and, over the years, she also refined her talents as a visual artist. 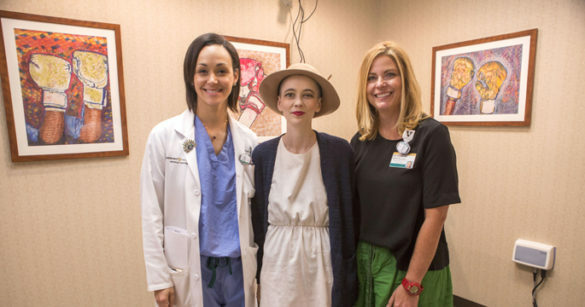 Recently she appeared before one of her most appreciative audiences who gathered in Vanderbilt-Ingram Cancer Center’s (VICC) Radiation Oncology department to witness the unveiling of paintings Zazu donated to the Cancer Center. Zazu created the artwork during her time as a cancer patient at VICC and donated prints of the paintings as a measure of gratitude to the Radiation Oncology staff. The 14 art pieces, created using mixed media including watercolors, paraffin wax and oil pastels, feature images of stylized boxing gloves over a background of colorful floral images. The prints, many of which already grace the walls in the Radiation Oncology Clinic’s brachytherapy suite, also are a gift to her fellow patients. “I wanted it to be something that was inspiring to people because I looked around in the waiting rooms and I could see there were a lot of people who looked like they were having a hard time. It’s not always about being able to land a punch; it’s being able to take a punch. Not just that, but take a break and have your team come in and fix yourself back up,” Zazu said. Zazu met the members of her VICC medical support team in the spring of 2016. She was on the final leg of a farewell tour with her music bandmates when she started experiencing gynecologic symptoms. Medical staff at Planned Parenthood diagnosed a serious problem and referred her for further tests that revealed advanced cervical cancer, an unusual diagnosis in such a young patient. She sought a second opinion at VICC, and Marta Crispens, M.D., professor of Obstetrics and Gynecology and a gynecologic oncology specialist, recommended an aggressive, comprehensive treatment regimen that included chemotherapy and radiation therapy. Diandra Ayala-Peacock, M.D., assistant professor of Radiation Oncology, devised and managed Zazu’s radiation therapy, which featured treatment using an advanced linear accelerator, followed by brachytherapy. During brachytherapy, an applicator is used to deliver radiation internally and a computer calibrates and controls the radiation dose to minimize the effect on nearby healthy tissue while delivering a higher dose directly to the tumor. Zazu and Ayala-Peacock developed a strong bond and the VICC physician invited her to create some visual art to adorn the walls of the brachytherapy suite. Zazu was delighted by the invitation. “I was so excited because I had brought my sketchbook into that room with me whenever I was getting radiated. I drew pictures of everything in the room so I knew, yes, it does need an upgrade. It was such a personal endeavor because I had already been in there and I thought this room could be much less intimidating,” Zazu said. Ayala-Peacock praised her patient, who has been on an “unbelievable journey” and said the artistic creations are a wonderful gift.